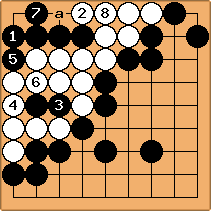 GNU Go is stronger than I am in some ways, so I've been playing against it a lot, mostly at 9x9 for tactical practice. I think I've discovered a weakness; it is not good at avoiding seki; I sometimes get away with things I shouldn't. 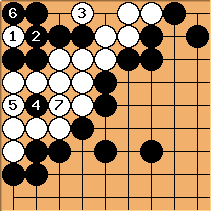 Here's an example, from a 2-stone game with me black. We were here as of move 24, W to play. White passed, which I suspect is a blunder. I think he should cover the vital point X, but I'm not entirely sure that is necessary. That's my question. We ended up with just a large black territory plus a large seki, complete disaster for White. But where did he go wrong? The pass? Or later? 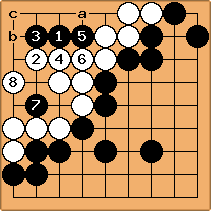 IGS 5K+: I believe Black 1 is the most important point to play and that White should waste no time in occupying the other key point, White 2. Up to 8 Black could play a, b, or c to start a ko but I see no chance of her winning any of them. If Black a, White b. If Black b or c, White a. So you are saying White's pass in the original position is OK because he can defend adequately against Black 1 later? 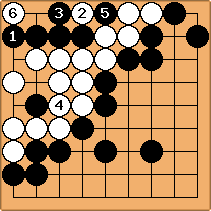 IGS 5K+: In this partcular situation the game is complete to my eyes and White is behind on territory. I would pass (I prefer to pass rather than resign if the end-game has already been fought). In general there is something to be gained from defending this group because otherwise if Black generates some ko-threats elsewhere she can use them to make a seki here. Black would play at b, and white would have to struggle to salvage even a seki. IGS 5k+: I don't see that White has any difficulties. 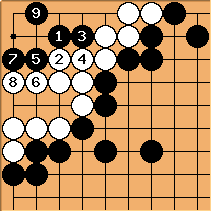 If Black descends to here then White can respond with . The sequence to leaves Black with nothing. IGS 5k+: Here Black tries cutting with but this comes to nothing too. Leaving the ko for last. 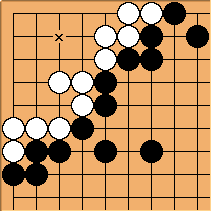 IGS 5k+: Because White has some ko-threats Black can't hope to win this ko. Please show us if you have a stronger resistance for Black. I don't see anything better than these. B@a looks to lead to an unfavorable ko for black (must find first threat). IGS 5K+: Ah! I didn't consider . It seems you are quite right and that Black can manage a seki after all.